Farhad Manjoo is lighting up the comment boards on Slate.com right now with a piece advocating the death of independent bookstores. Manjoo, Slate's technology writer, is responding to a Monday New York Times op-ed written by novelist Richard Russo, who decried Amazon.com's ruthless commercial practices and suggested they were killing the country's local literary sub-cultures. Manjoo expresses disdain for the retail giant's more aggressive business tactics but argues that Amazon's cheaper prices, sophisticated recommendation engine and Kindle options are actually breathing new life into the book world, and that readers and writers alike should be happy about that. "Sure, Amazon doesn’t host readings and it doesn’t give you a poofy couch to sit on while you peruse the latest best-sellers," he writes. "But what it does do —allow people to buy books anytime they want — is hardly killing literary culture. In fact, it’s probably the only thing saving it." Question: Newspaper budgets have been slashed over the last decade because Craigslist found a better way to deliver classified ads. Travel agencies have shuttered because the Expedias and Travelocitys of the world put those services directly in consumers' hands. 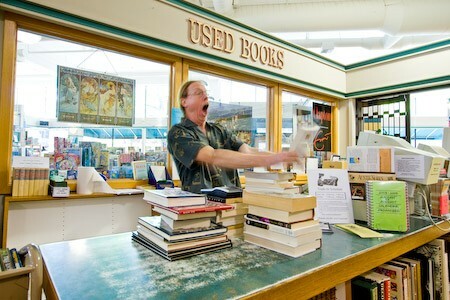 So are local bookstores just the next industry to be outsmarted, or do they offer a value that Amazon can't match? If so, will that value be enough to save them?